Action from a league game between Phantoms and Sheffield Steeldogs last season. Coach Slava Koulikov insists results do not matter as the new-look Phantoms prepare to hit the ice this weekend. The city team, who have undergone something of a transformation with seven new summer arrivals, take on English Premier League rivals Sheffield Steeldogs in a pair of challenge clashes. The two sides meet at Planet Ice on Saturday (7pm) ahead of a return date at IceSheffield the following day (5.30pm). 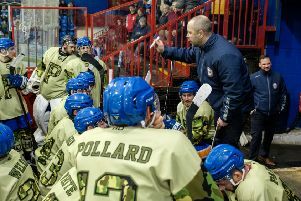 Koulikov said: “It has been a long summer with a lot of new faces coming into the club, so this weekend is all about getting as many bodies onto the ice as possible. “Pre-season games are about working on lines and combinations, and making sure the guys plenty of minutes into their legs. “It takes three-or-four matches for players to get up to full speed after the summer break and it is all about ensuring they are ready for the start of the league season next month. Phantoms will take to the ice without two of their main forwards against a Steeldogs outfit who they also face in their first competitive EPL fixture of 2016/17 on September 10. New import Petr Stepanek and British capture James Archer are still in the Southern Hemisphere after spending the summer playing in Australia and New Zealand respectively. The remaining members of the Phantoms squad met up for the first time on Tuesday for the start of their pre-season camp over at Tallington Lakes. They took part in fitness tests and teamwork exercises ahead of a bonding barbecue before shifting their attention onto the ice with practice sessions planned for yesterday (Wednesday), today and tomorrow. The Friday session is open for public viewing with a ‘Meet the Players’ event following in the Planet ice Bar. “It was good to have the vast majority of the guys together,” added Koulikov. “We believe a pre-season get-together has a lot of benefits in terms of fitness and in building the team spirit. Phantoms are offering free entry to children for both of their home pre-season games – the clash against Sheffield this Saturday and the second leg of their traditional ‘Ashes’ battle against big rivals Milton Keynes on Sunday, September 4. Adult admission for the games is £14 with concessions set at £8.